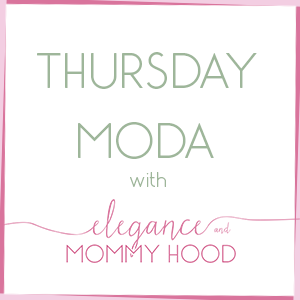 Thursday Moda #86: Is it a Sweater, is it a Blouse?! This outfit was worn exactly a week ago, on the evening of my brother's birthday. I love how effortless the combination of Deep Purple (in a shade of grape), Olive Green, Navy, Orange, a little Blush+Taupe and touches of Dark Red worked together. All of these colors are great for Autumn and even match the pretty foliage and leaves we are seeing everywhere in Michigan, these days. But let's focus on the star of this outfit first: the top. Is it a Sweater, is it a Blouse?! How about both. It is a knit on the front and a silky material on the back in a floral orange/burgundy pattern. This sweater is by Loft, currently on clearance with an additional 40% OFF. I love the bow-tie detail on the sleeves and let's face it the mixing of the silky floral print and knit material is genius. They had this sweater in a black+white version and another color/pattern combo (this one) and an all-white monochrome mixed media sweater (here). They are all on sale for 50 bucks each plus the additional 40% OFF which makes them $30 each (my math is always good =P). Loft has been doing these awesome types of sweaters lately that look like two layered tops, for the last couple of years now. They also have this oxblood tie-back sweater which I love. Here is another one very similar to mine, in burgundy with the floral blouse look on the back, minus the bow sleeves. 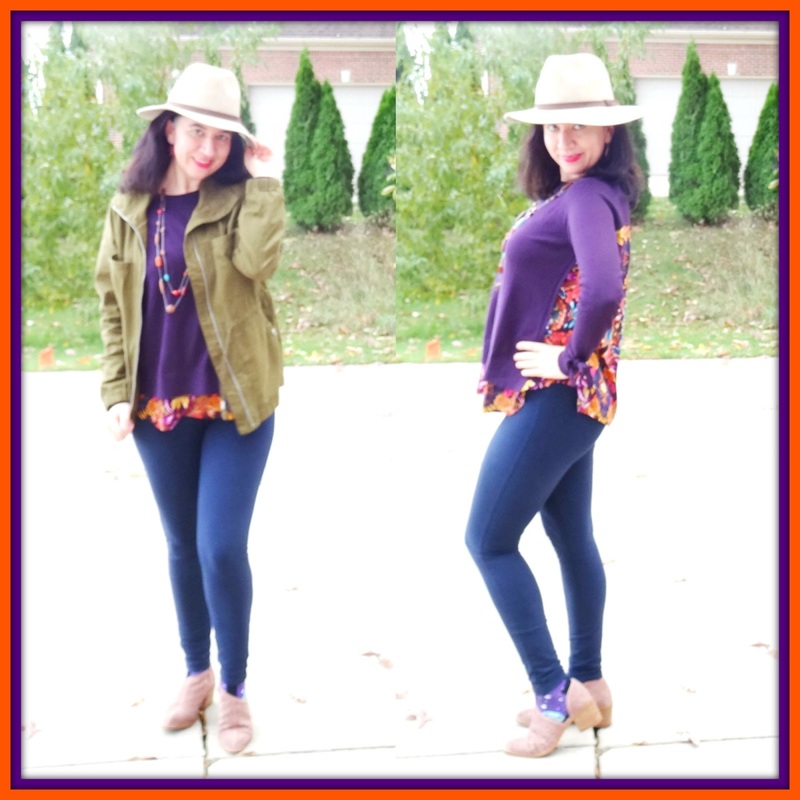 I gave you two options of this outfit: with or without the Olive Green Utility Jacket which I purchased from Old Navy in Spring of 2016 but Old Navy currently carries my jacket again though I could not find it online (here is the black version, on sale - I want!!). 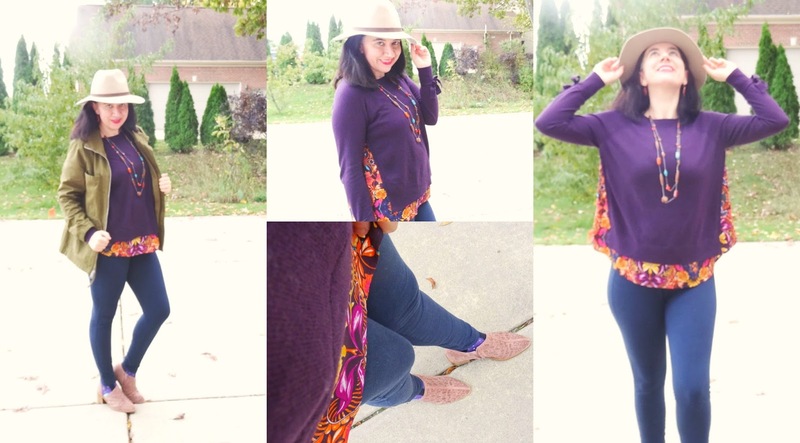 What I also love about my sweater is that the colors of purple and orange make it quite awesome and proper for Halloween (I am not one that does Halloween costumes LOL). All the other sweaters at Loft (including new arrivals) are currently 40 bucks or less. 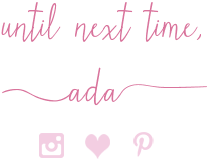 Below in the widget I narrowed it down to my top 10 current favorites ALL ON SALE. So hurry because Loft changes their sales daily or keeps them for just 2-3 days. Back when The Limited was still in business, I used to buy a lot of their sweaters, dressy pants and I own a lot of their jewelry. This beaded necklace is from them. 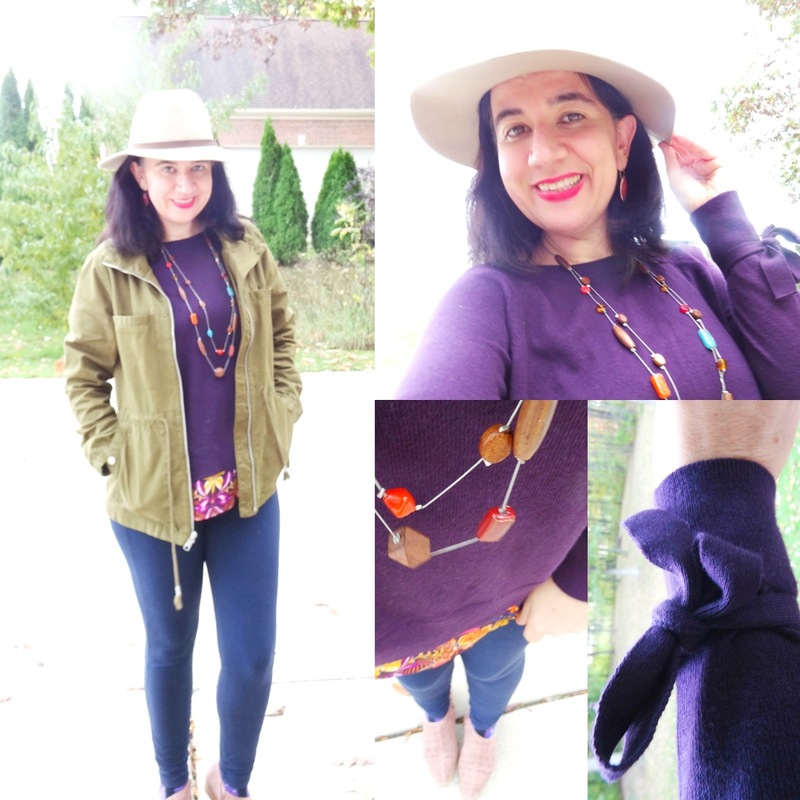 It has dark wood, deep red, orange and teal beads and all those colors tie in so well with the colors of this outfit. I mean isn't this necklace the perfect match to this sweater?! I have already worn this long beaded necklace at least 5-6 times this month and I can see wearing it all Fall and Winter long. Long necklaces (with beads, pendants, tassels, etc.) are great pieces to wear for cold months on top of your sweaters or layered over your tops and blouses with a cardigan over the top. 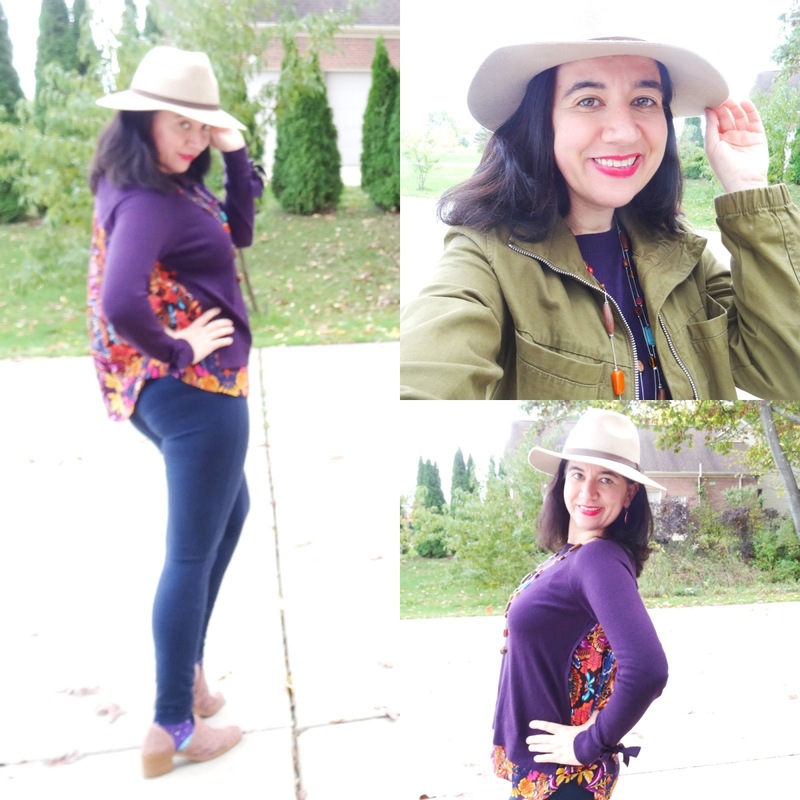 You may remember that just last week on Thursday Moda #85 I styled these Ponte Leggings. They are navy, in a thick, not see-through ponte material and I just purchased the last week at Old Navy (already worn them 3 times). These Navy Knit Leggings also come in other neutral colors like a light grey, a charcoal grey and black. Last time I also styled them with the Mauve Booties and the same Taupe Floppy Panama Hat as today. 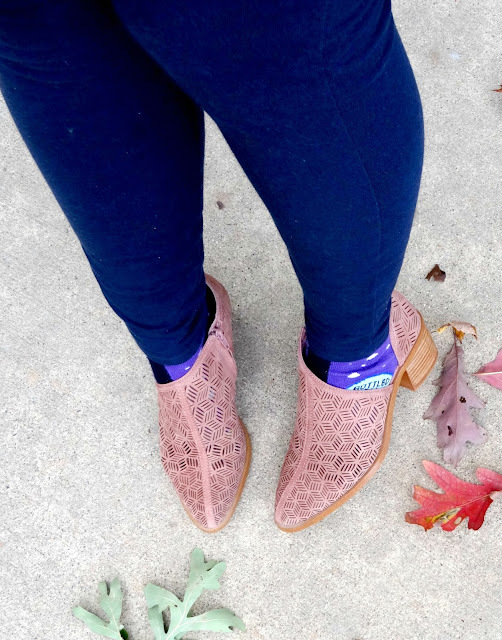 As the weather has dipped into the 50s, even the 40s, it is very important to wear socks with your booties, especially if they are short/low or have side openings/cut-outs (like mine do). I did just that this day because it was cold. I picked these Patterned Socks on purpose because I think they would look cute with this quirky, bold, colorful look. Plus the socks add to the bohemian feel of this layered Fall look. The socks are mostly black and purple (with some navy) - again great colors for Halloween and all those colors match the rest of the outfit, too. They have martini glasses on one side, and ladies sipping on their fancy martini stem glasses on the other side. These socks are by Davco, come in a pack of two. Here is a set of 2 pairs with martini glasses. These patterned socks are cute, well made and a steal for $6 for 2 pairs. Last week the linkup was a little lighter, but there were still many beautiful outfits (around 80) linked. I selected these 4 as my favorites. Two are very polished and tailored, serious office/work looks, one is completely edgy, bold and very different, while the other one features many Fall staples layered together. Lizzie is wearing 'A Classic Coat' with some signature-for-her items: ruffles and a touch of pink. I love the coat and skirt. Ashley is 'Moonlighting as Hefner' in this maroon+white striped pajama-style set she wore to Kansas City Fashion Week. On 99% of the population this would look silly but not on bold, stylish and edgy Ashley. Lorena is spending her 'Long Days' at the office in classic outfits like this. A black pencil skirt is a closet staple for every professional woman and that sequin detail millennial pink blouse is perfect for this month. Class! Shauna's 'Sunday Stroll' is accompanied by the cutest dog. Her Maltese?!? companion is not only adorable but matches mama as both are wearing sweaters perfect for a football game. Simply lovely! Wear cute socks with your booties when you pair them with leggings or skinny jeans. Make the socks part of your outfit. Sometimes the most unexpected accessory can totally elevate a look or add something different to an outfit. This works especially if you are doing a head to toe monochrome look: pick a pair of bright socks that are a different color than the rest of your outfit.